KINSHASA, 28 March 2007 (IRIN) - The recent violence in the Democratic Republic of Congo (DRC) was irresponsible and should be replaced with a spirit of reconciliation and inclusiveness to ensure stability in the fragile country, said European Union envoys. Addressing a news conference in the capital, Kinshasa, on Tuesday, they expressed indignation at the violence that rocked the city on 22-25 March, and condemned the loss of life, especially of civilians. "There remains a war spirit in the country, which is a bit like malaria," the UK ambassador, Andy Sparkes, said. "We thought we had healed the country with a big dose of quinine, with the holding of free and transparent elections last year, but this war spirit has returned." 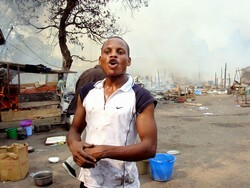 The violence erupted when armed forces clashed with the private guards of opposition leader, Jean-Pierre Bemba. The army had sought to disarm Bemba's troops. Greek ambassador Ioannis Christofilis said attacks on foreign missions broke the Vienna convention on diplomatic relations, while the Italian ambassador Leonardo Baroncelli said uniformed men broke into his residence on 23 March and stole property. "There needs to be a new spirit of reconciliation with a real engagement of the authorities for democratic opposition, where the liberty of expression is reaffirmed," said Sparkes. "Violence needs to be denounced so that dialogue can continue." The EU estimates that more than 500 people could have died in the violence. DRC authorities later issued an arrest warrant for Bemba who sought shelter in the South African embassy. "All those who are responsible for insecurity will be tracked down," President Joseph Kabila said. "It was not a political problem; [it] was military. We needed to act quickly. And that is what we did." Medical workers said hospitals were overwhelmed by hundreds of injured civilians. A surgeon in Kinshasa's general hospital, Katamba Mbewbe, said the facility received "a lot of injured people". A few hundred people fled across the river to nearby Congo Brazzaville. The NGO Caritas said it was distributing medical supplies within the city. "We started on Saturday [24 March] because the hospitals and morgues were overloaded," said a spokesman, Guy-Marin Kamandji, adding that the general hospital had received 150 bodies. "This is why we brought formalin and disinfecting products. We want the bodies, which have started putrefying, to be stabilised before burial." It was not a political problem; [it] was military. We needed to act quickly. And that is what we did. The International Committee of the Red Cross deplored the situation. "There were dozens of dead bodies left lying at the roadside, many of them civilians. It was a distressing sight," said Max Hadorn, head of the ICRC delegation in Kinshasa. Ever since Bemba disputed the results of the 29 October run-off presidential election, which gave Kabila 58.05 percent of the vote, leaving him 41.95 percent, Kinshasa has been living in fear that clashes could recur between his guards and government forces. This month, tension rose after he refused to disarm his men and accept police guards. The elections, the first in 40 years, were seen as the best opportunity to return peace to the war-ravaged country and to encourage the return of an estimated 1.2 million displaced Congolese and 410,000 refugees in neighbouring countries. In New York, UN Secretary-General Ban Ki-moon urged the government and opposition "to shoulder their responsibilities to democracy" to ensure a full transition to peace. "I strongly urge the political leaders in the Democratic Republic of the Congo to respect the principles of transparency, inclusiveness and tolerance of dissent," he said in a report that called for an extension till 31 December of the UN Mission in DRC (MONUC). MONUC, which has a military and police strength of almost 18,000, supplied food, water and medicine to 1,300 people caught up in last week's fighting and evacuated about 1,100, including the Nigerian ambassador, who was wounded in the legs. "Opposition parties should adhere to those same democratic norms, voicing their views responsibly and without resort to violence," Ban added. "Failure to adhere to these democratic principles would seriously undermine the credibility and ultimate legitimacy of the country's political leaders and institutions."